Rodent droppings, gnaw marks, damaged items in the attic are all signs of a rodent problem. Rodents leave evidence behind whenever they have been feeding or nesting. Most are unaware of a rodent control issues until these signs are present. Why So Many Rodent Droppings? Rodents nibble often on their food sources, which means they also defecate frequently. Combine this with a fast metabolism and you have quite a lot of rodent droppings. Rats and mice leave droppings where they feed and also while they are traveling between their nests and food sources. Rodent urine and rodent feces contain a pheromone that attracts other rodents. Which Rodent Control Method is Right for You? There are different options when it comes to rodent control. 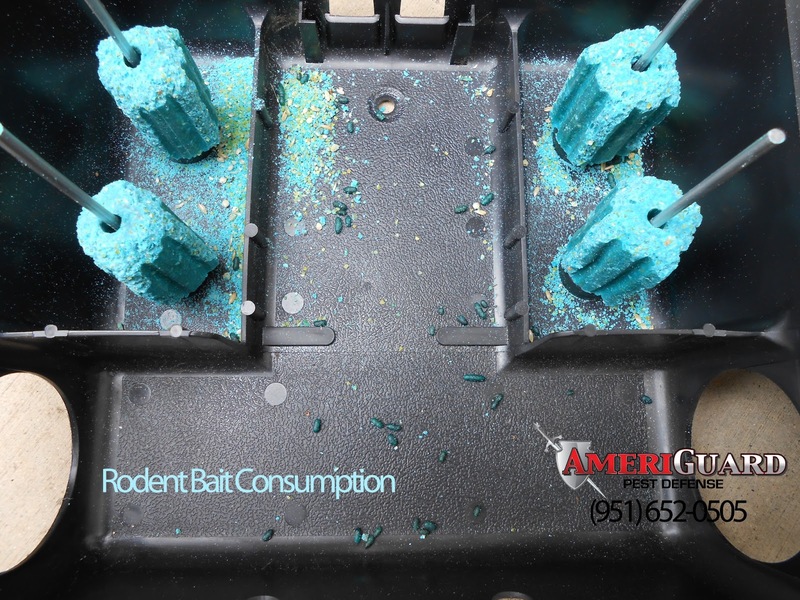 Some residences and commercial buildings are good candidates for traps and/or glue boards, while others are effectively controlled by single-feeding baits placed in tamper-resistant bait boxes. 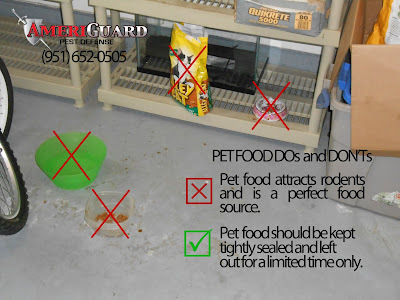 Other situations are able to be rodent-proofed by excluding entry points that are accessible to rats and mice. Rodents can gain access to a structure pretty easily and with just the smallest of openings. A pair of House Mice can produce up to 18,000 droppings in a 6 month period. One Roof Rat can produce 30-150 droppings in one day. 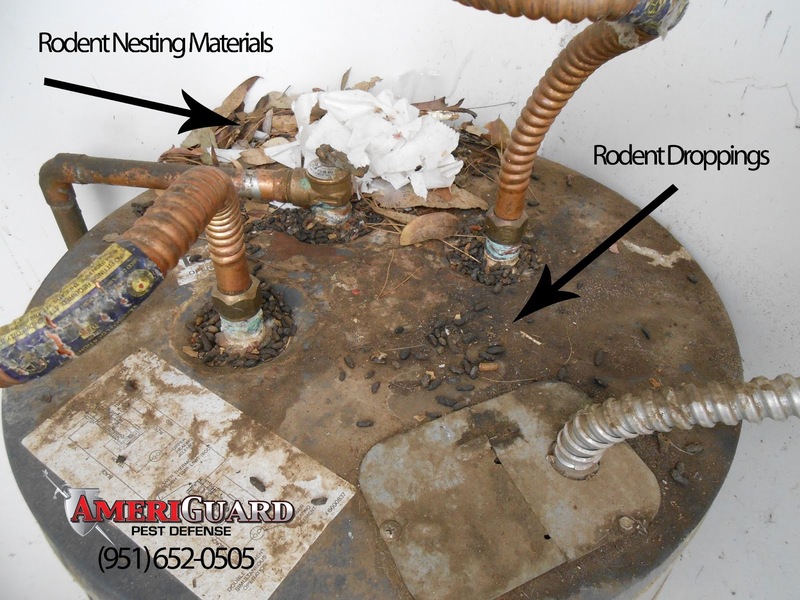 In the below case study, rats have been using this water heater to build a nest. Notice the droppings on the top of the water heater unit. The droppings have rounded ends instead of pointed ends, meaning that these are Norway rats. In the below image, you can see that the rats have been feeding on the bait. Each side of the bait blocks have been gnawed and shaved down. Most importantly, the rodent poop is colored, which confirms that this rodent (or rodents) is feeding on the bait and should have received a lethal dose. A second-generation anti-coagulant bait should produce dead rodents within 4-5 days. A successful baiting program for rodents requires the help of our customers. For example, pet food must be stored in tightly sealed containers and empty bowls picked up after pets are finished eating. Rodents are attracted to pet food and prefer this as a food source. All other food sources need to be removed In order for rodents to be interested in feeding on the rodent bait and to avoid competing food sources. Rodents can be controlled by a variety of methods. 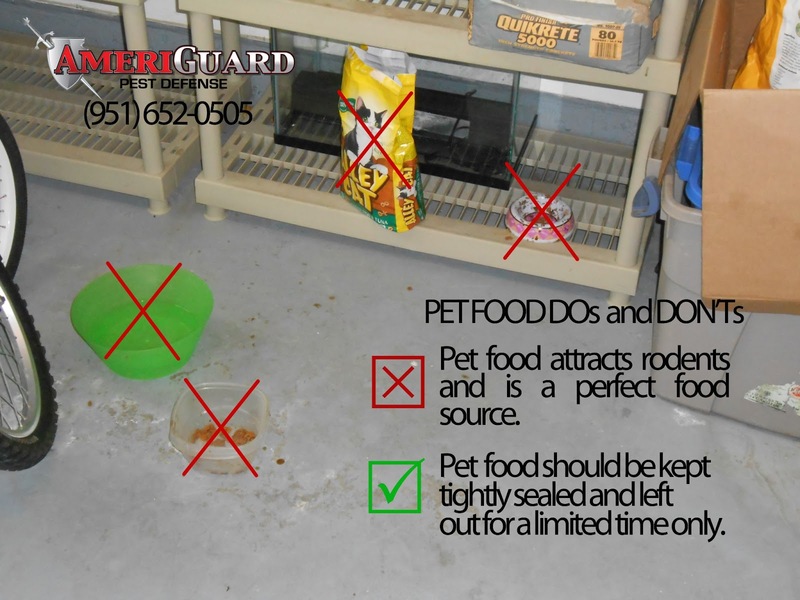 AmeriGuard Pest Defense is available to answer all of your rodent questions and concerns. We can recommend a control program based on your rodent problems. We can provide trapping services, glue boards and/or a baiting service. If you are in Southwest Riverside County, give us a call today at (951) 652-0505 for a free rodent control estimate.